only one of five will open. Go to Ghen's lab on Book Assembly Island and find the small drawer on one of the tables. One of these drawers will open and inside you'll find some broken eggs. 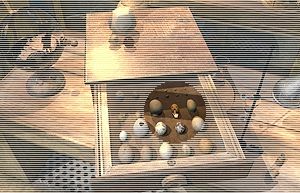 Very symbolic indeed - the first secret spot is the small orange and unbroken egg.